I found the book to make this journal from my local thrift shop. The covers measure 5-3/4" wide by 8-1/2" high with a 2-1/4" thick spine. You can use any size book, just adjust the number of signatures or pages as needed. The paper stack I used for this project is titled "Storyteller" by Linda Wood and I purchased it from Michaels. I picked up a sketch book from a dollar store that contains 60 lb acid free paper and used that for my journaling pages, and also for coffee staining. My dollar store also stocks bamboo cord which is perfect for binding the pages. You can see a process video for coffee staining paper by Lori (Just A Girl From The Bay) on YouTube at https://youtu.be/dJlg-OWUtrI. 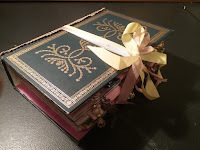 Below are the supplies I used to make this journal. Process video for coffee staining paper by Lori (Just A Girl From The Bay) on YouTube at https://youtu.be/dJlg-OWUtrI.